After intermission, a 12 lap IMCA Modified concy hit the track. Only the top five would transfer to the feature. Brent Schlafmann led from the pole as second place Jason Dinius got loose in turn two, stacking up the field behind him. Veteran Dave Aberle, making his second appearance this season, passed Eric Fetzer for third and challenged Dinius for second. Aberle continued his march to the front by passing Dinius and cutting into Schlafmann's lead. Meanwhile, back in third, Dinius had his hands full with a strong Tim Perkins. Perkins would take the third position and run down leaders Schlafmann and Aberle. With three laps remaining, Perkins passed Aberle for second and charged into the lead. Perkins led the final three laps to win the concy over Schlafmann and Aberle. 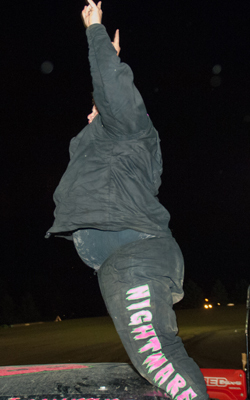 Jason Dinius finished fourth and Kirk Wojahn, who started 11th, finished in the fifth and final transfer position. Points leader Josh Roehrich challenged pole sitter Nic West for the lead in the IMCA Sport Compact feature. West held off Roehrich to lead lap one. Roehrich was bumper to bumper with West while Kody Stoxen followed in young Chance Seelye's tire tracks for third. They ran nose to tail for several laps before Seelye started to drive away from Stoxen. Seelye held off Stoxen to finish third, a career best finish for Seelye. Nic West led all 10 laps to win his third feature of the season over points leader Roehrich while Dickinson's Gary Barnett rounded out the top five. Chad Hausauer powered into the lead in the Hobby Stock feature. Hausauser quickly pulled away from the field and the race was for second between pole sitter James Weber and Jeremy Engelhardt. Engelhardt would win the battle and take the second position on lap four. Napoleon's Jaren Wald was all over fourth place Roy Erickson's bumper. They raced side by side for several laps before Wald took the position on lap seven. When third place Weber got too high off the banking in turns three and four, Wald dove low under Weber to take the third position with one lap to go. 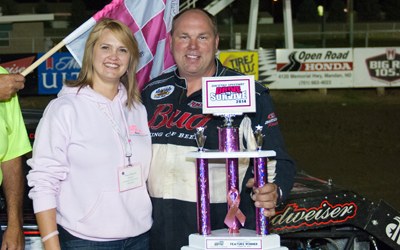 Chad Hausauer led all 15 laps to win his third feature of the season. Engelhardt's second place finish was enough to cut points leader Brent Vetter's lead down to 11 points. Wald finished third ahead of Weber and Erickson while points leader Vetter finished 8th. 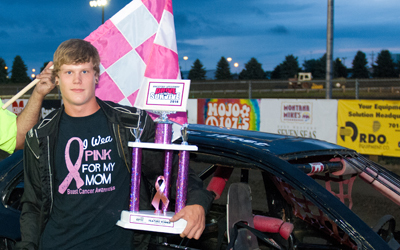 Lincoln's Barrett Berg bursted into the lead in the WISSOTA Street Stock feature. As Berg started to pull away from the field, Shawn Volk passed pole sitter Kelly Hoerner for second. Volk started to cut into Berg's lead but Berg suddenly had mechanical problems, ending his night early. Volk inherited the lead on lap eight but a caution with six laps to go reset the field. On the restart, John Feist muscled his way between Matt Brendel and Matt Dosch, making it a three wide race for second. Feist shuffled into second with four laps to go but Brendel rallied back to retake the second position the following lap. 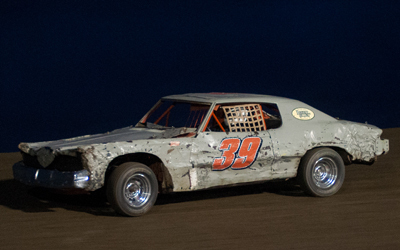 Brendel made a late race charge at leader Volk but ran out of time as Volk crossed the Open Road Honda finish line first, picking up his first feature victory of the year at the Dacotah Speedway. Points leader Eric Paul finished third ahead of Scott Olson and John Feist. In the INEX Legends feature, Joe Gartner led the first lap before Mercer's Jon Schumann took the lead on lap two. Gartner and young Troy Hoff bri efly battled for second before Hoff passed Gartner and challenged Schumann for the lead. Hoff blew into the lead on lap three as Gartner began a backward's slide through the field, losing positions to rookie Anthony Kopp, Paul Morman and Donavin Wiest. A series of short cautions regrouped the field and on the restart, leader Hoff pulled away as Schumann and Kopp battled for second place. Kopp would win the battle as Schumann tried to hold off a strong Drew Papke. Papke powered by Schumann with four laps to go and brought Minot's Shane Williams with him. With two laps to go, Papke and Williams ran down Kopp for second. It was a three car battle for second before Papke and Williams shuffled by Kopp with one to go. Kopp finished a career best fourth place ahead of Jon Schumann. Troy Hoff dominated to win his third feature of the season over Papke and Williams. In the final feature of the evening, Brian Swenson blew into the lead in the IMCA Modified feature. Swenson quickly pulled away from the field as Tracy Domagala passed Brad Hanson for second, bringing Shawn Strand with him. Domagala and Strand battled side by side for second while Travis Olheiser and Mark Dahl raced door to door for fourth. Dahl would take the position as Strand cleared Domagala for second. A caution on lap six reset the field and on the restart, Domagala retook second place from Strand. Strand rallied back and they continued to race side by side for several laps before Strand won the battle. As the laps wound down, Strand cut into Swenson's lead. They briefly raced side by side before Strand took the lead with nine laps to go. Lapped traffic helped third place Marlyn Seidler catch Swenson and using the lapped cars as a pick, Seidler took second with four laps to go. Domagala quickly caught Swenson and as they came across the Open Road Honda finish line, Domagala just narrowly edged Swenson for third. 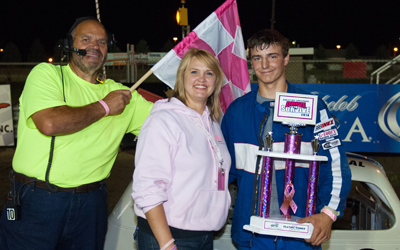 Marlyn Seidler finished a distant second to feature winner Shawn Strand, his third win of the year. Sydney, Montana's Hank Berry rounded out the top five. A special thank you to all of the drivers who took the time last Friday to help pack the track: Jason Dinius, Scott Gartner, Dustin Frank, Chad Entzel, Kelly Hoerner, Matt Dosch, John Feist, Eric Paul, Scott Olson, Nathan Messer, Dustin Herz, Eric Harpole, Allen Frederick, John Weber Jr, Tanner Dosch, David Falkenstein, Shawn Volk, Dylan Thomas and Dave Aberle. Without your help last Friday, we may not have finished the races. Thank you!